GoPro’s got itself quite a stable of little cameras these days. We already had (from high end to low end) the Hero4 Black, Hero4 Silver, Hero4 Session, Hero+LCD, and the straight up Hero. Now, squeezing in between those bottom two, comes the Hero+. It’s a $200 version of the Hero ($130), but it has Wi-Fi and has significantly upgraded shooting modes. Examples? The Hero tops out at 1080p30. The Hero+ Goes to 1080p60. It also has options for SuperView—a mode that crams more into the top and bottom of your shot—which is nice for board sports and POV video. It also shoots 8MP stills instead of 5MP, and it has an auto low-light mode. The Wi-Fi means you can frame shots and transfer footage directly from your phone. I’d call these advantages worth the $70 step-up fee. Or you could cough-up another hundred and get the Hero+LCD which has a built-in screen, but that seems a bit high at this point. Externally the Hero+ looks basically the same as the Hero, with the camera built directly into its waterproof housing (waterproof to 131 feet). It should be compatible with any existing GoPro mounts and accessories, too. But again, as with the Hero, there’s no removable battery, which could be a big problem on longer shoots. Something to consider. 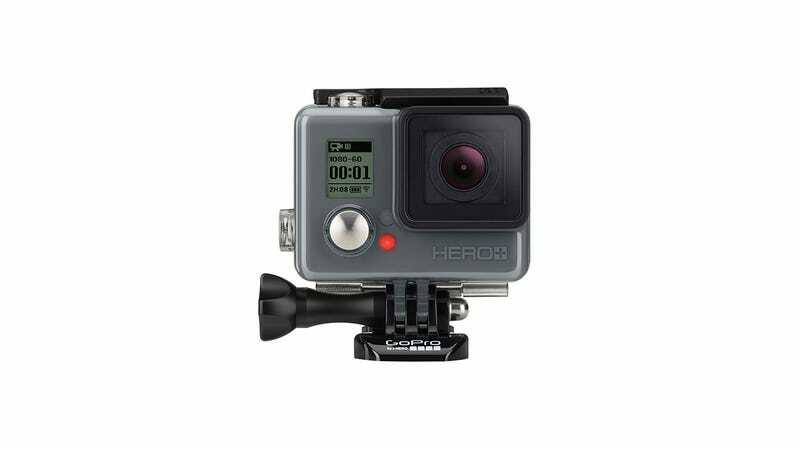 The other big news is the the Hero4 Session’s price has dropped from $400 to $300. This is what it should have cost from the get-go. The Session is definitely a decent camera, and its low-profile, all-in-one form factor is very appealing, but $400 is what the Hero4 Silver costs, and that camera blows the Session out of the water in terms of image quality and options. There just wasn’t enough justification to buy the Session. Now that it’s 100 bucks less, though, that wee form factor starts looking better.